The popularity of Strawberry Ice Cream has not waned since Americans first tasted it in the 18th century. In fact, the first ice creams eaten in America were made with fresh strawberries and milk. Paul Dickson tells us in his book 'The Great American Ice Cream Book' that the first record of it being eaten in the United States was in the 1740s when a guest of Governor William Bladen of Maryland wrote in a letter that he "had dessert no less Curious; among the Rarities of which it was Compos'd was some fine Ice Cream which, with the Strawberries and Milk, eat most Deliciously". 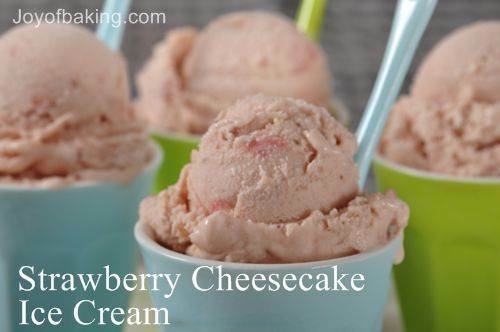 This Strawberry Cheesecake Ice Cream recipe combines the flavors of cheesecake and strawberry ice cream. To make this ice cream, the cream cheese is beaten with the eggs and sugar and then hot cream is whisked in. This mixture (which is really a custard) is cooked over a saucepan of simmering water until it coats the back of a spoon (170 degrees F) (77 degrees C). (The term 'coat a spoon' is a technique used mainly as a way to test when an egg-based custard or sauce is done. A spoon, usually wooden, is placed in the custard and, when the spoon is raised, the film of custard on the back of the spoon will stay in place even when you draw a line with your finger through the middle of the custard.) Remove from heat and then stir in homemade strawberry sauce. Making the custard the night before so it has time to chill sufficiently allows the ice cream to freeze before the churn gets too warm and gives the ice cream its smooth texture. The custard should only fill your ice cream machine about half to two thirds full. This is so the custard has enough room to expand while it freezes so you end up with an ice cream with a light texture and no graininess. As the ice cream is still quite soft once it has been churned in the machine, transfer it to a storage container and place it in the freezer for a few hours before serving. This also allows the flavors to mellow. Although I prefer to eat homemade ice cream the day it is made, it can be stored for a few weeks in the freezer. It will become quite hard after being frozen for any length of time so transfer it to the refrigerator to soften for about 30 minutes before serving. 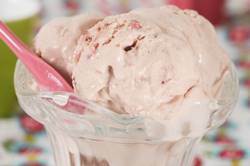 Strawberry Cheesecake Ice Cream: In a small saucepan, over medium-high heat, bring the half-and-half and the vanilla bean (if using) to the scalding point (the milk begins to foam up). Remove from heat, take out the vanilla bean and scrape the seeds from the bean with the back of a knife, and mix the seeds back into the half-and-half. Meanwhile in a stainless steel bowl beat the cream cheese, egg yolks and sugar until light and fluffy (about two minutes). You can do this with a wire whisk or I like to use a hand mixer. Gradually pour the scalding half-and-half into the whipped egg yolk mixture, making sure you keep whisking constantly so the eggs do not curdle. If any lumps do form, strain the mixture. Immediately remove the custard from the heat and continue to stir the custard for a few minutes so it does not overcook. At this point stir in the vanilla extract, if using, and the strawberry sauce (puree). Cover and let cool to room temperature and then refrigerate the custard until it is completely cold (several hours but preferably overnight). Transfer the cold custard to the chilled container of your ice cream machine and process according to the manufacturer's instructions. Once made, stir in the cut up fresh strawberries (if using) and transfer the ice cream to a chilled container and store in the freezer. If the ice cream becomes too hard place in the refrigerator for about 30 minutes before serving so it can soften.